In this solo dining adventure, Gary visits HB Burger in Times Square while hoping that this isn’t the typical Heartland Brewery restaurant. 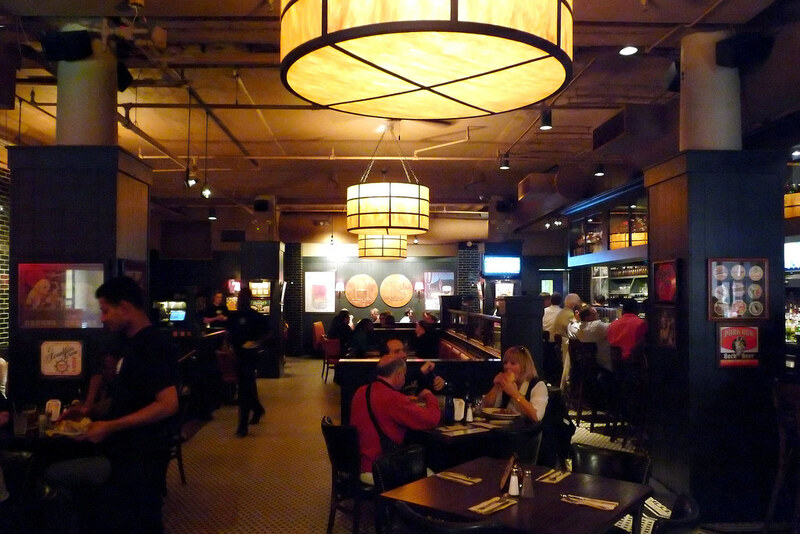 When I think of Heartland Brewery, I think of decent but unspectacular beers. Their food, for the most part, also fell into that category though I think I’d describe it more as mediocre. It’s a shame really since New York City is absolutely devoid of a brewpub culture – outside of the Heartland empire, what’s left are a few (emphasis on few) other places in Manhattan. For a large city, you wouldn’t think that’d be the case, would you? Thankfully, the beer has improved over the past few years owing mostly to their concerted efforts in their seasonal beers. Unfortunately, the food failed to keep up with their improving beers stuck in the same mediocrity they’ve wallowed in since the beginning of the previous decade when I first went to their Union Square location. As the empire has expended, they’ve added BBQ, Rotisserie, and Chophouse to their portfolio of restaurants and the verdicts on these additions have been mediocre. With all that knowledge, Heartland Brewery’s newest joint, HB Burger, did not instill in me great confidence that it would be good. I just assumed that this was a cynical attempt on their part to cash in on the white-hot burger fad in the city. Still, it’s a burger place and I do love my burgers so it was an inevitability I’d try it. I’m glad I got over my initial assumption of HB Burger because this place ain’t like the other Heartland Breweries. Yes, it still looks like any other Heartland Brewery when you walk in – after all, they do have a look that’s consistent throughout the entire chain – and they still have the same beers on tap. The food here? The food here is well beyond mediocre – it’s actually pretty darned good. 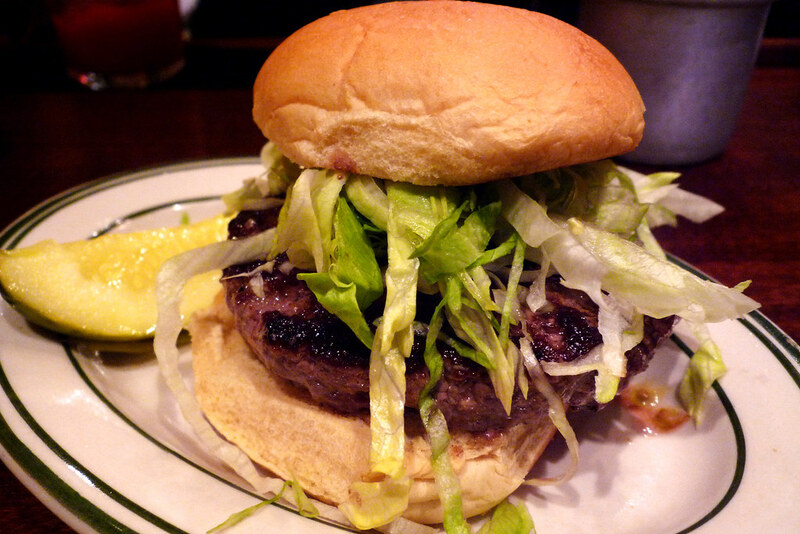 The HB Beef burger is their standard house burger – a blend of flank, chuck, and prime rib. Cutting through the well-salted crusted exterior released a flood of meat juices and revealed a perfect medium-rare interior, just the way I like my burger. Despite all the juices that came out, the bun managed to stay intact which, sadly, is no small feat. The burger itself had a very noticeable beefy flavor enhanced and drawn out by it being well-salted. Altogether, the beef and the surprisingly sturdy bun make for a very complementary bite. If I have any complaint, it’s their choice of shredded lettuce – it’s just too messy and have trouble staying on the burger. The fries here are a la carte but it’s worth ordering. They’re fried to a perfect crisp and they’re well salted. They’re served in a cone so they’ll stay warmer longer but like with any french fries, they’re best when hot and fresh. To Heartland Brewery, I offer this mea culpa – I was wrong to assume that your HB Burger would follow in the footsteps of all your other restaurants. The burger here is very tasty, so tasty that their meat juices compelled me to run the any fallen shredded lettuce through them just to absorb it all. Solid fries and a good seasonal wheat beer rounded out the meal. Until the Shake Shack a few blocks away opens up, HB Burger can lay claim as my favorite burger in Times Square. HB Burger. 127 West 43rd Street, New York, NY 10036. [Show/Hide Map] (212) 575-5848.
agree 100% that the burgers are far better than anyone has a right to expect. and if you’re not in the mood for fries, the fried kosher dill pickle spears are an excellent alternative. Lots of places have fried pickles, but HB Burger gets them more right than most. @dave I’ll have to give the fried pickle spears a try the next time I’m there. I’m a sucker for them. Woulda gotten them this time but I had to do the fries on a maiden voyage just to see how they turned out. 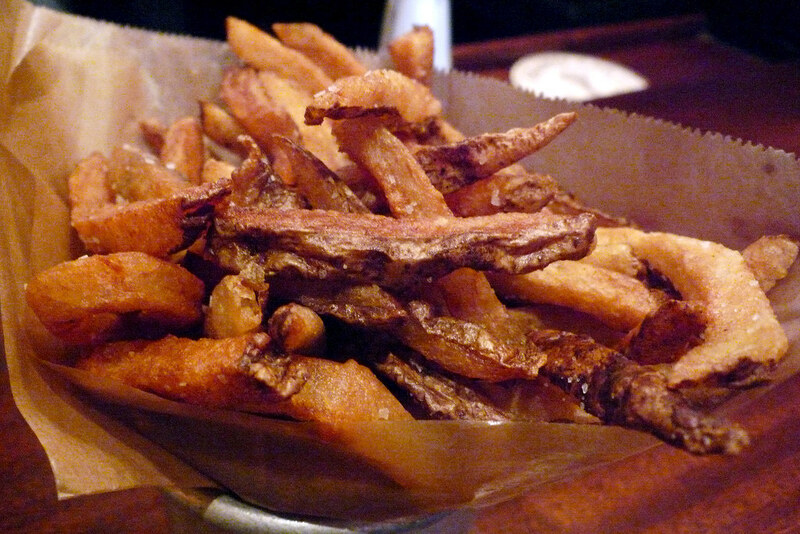 any burger….it’s just filler Fries have to be fresh, hot and salted or you might as well eat potato chips. Good post.Thanks.